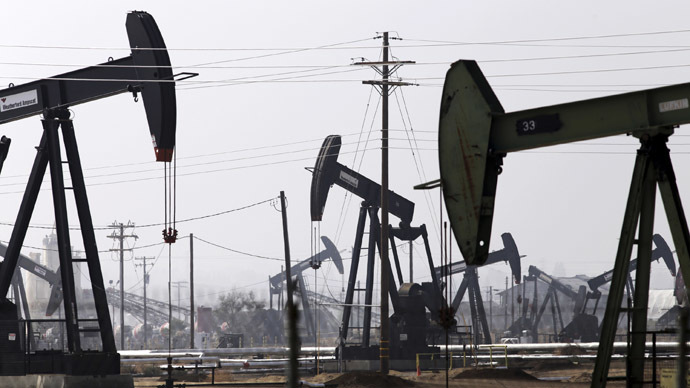 The US Geological Survey has called for more transparency and cooperation among “interested stakeholders” in order to monitor and mitigate the effects of fracking, a process widely blamed for the recent explosion of earthquakes in states like Oklahoma. A new USGS report, published in the journal Science, connected the increase of unnatural seismic activity in states targeted for oil and gas drilling -- including Oklahoma, Texas, Ohio, and Pennsylvania -- with the injection of wastewater vital to the process of hydraulic fracturing, or fracking. To unleash oil or natural gas from shale or other areas, fracking requires blasting large volumes of highly pressurized water, sand, and other chemicals into layers of rock. "In contrast to natural earthquake hazard, over which humans have no control, the hazard from induced seismicity can be reduced," USGS geophysicist Art McGarr said in a statement. "Improved seismic networks and public access to fluid injection data will allow us to detect induced earthquake problems at an early stage." The number of earthquakes -- many of them fairly minor in magnitude -- reported last year in Oklahoma, for example, was four times greater than in 2013, according to the USGS report. In Ohio, a study published in October found that fracking had a direct connection to some 400 micro-earthquakes in the state. In March 2014, fracking was blamed for causing 77 earthquakes in the small Ohio town of Poland Township, a place that had no previous experience of seismic activity. “The science of induced earthquakes is ready for application, and a main goal of our study was to motivate more cooperation among the stakeholders — including the energy resources industry, government agencies, the earth science community, and the public at large — for the common purpose of reducing the consequences of earthquakes induced by fluid injection,” said co-author of the report, Dr. William Ellsworth, a USGS geophysicist. It remains to be seen, though, how oil and gas drilling companies will respond to a call for increased transparency when they have avoided divulging -- often under the cover of official regulatory agencies -- just what chemicals are involved in their toxic injection fluids. Yet drillers insist the chemicals do not endanger human health, contradicting findings by scientists and environmentalists. Once used, toxic fracking wastewater is then either stored in deep underground wells, disposed of in open pits for evaporation, sprayed into waste fields or used over again. In addition to quake activity, fracking has been linked to groundwater contamination, exacerbation of drought conditions and a variety of health concerns for humans and the local environment. Mounting concerns over the negative effects of fracking have pushed communities across the US to take action, though they have faced resistance from both the energy industry and their respective state governments. A fracking ban was recently instituted in Denton, Texas, a town of 123,000 located on top of the natural gas goldmine that is the Barnett Shale formation, the birthplace of the much-maligned oil and gas extraction method. Yet, like other localities that have tried to protect themselves by banning or curbing fracking, the energy industry moved swiftly to legally negate local home rule, as a lawsuit was filed seeking to reverse Denton’s ban. In Ohio this week, the state Supreme Court narrowly ruled against one local fracking ban for its attempt to supersede state-based regulatory permitting power. Fracking opponents in other Ohio towns, though, seem to believe the court’s decision leaves room for them to maintain their own bans through invocation of their civil and constitutional rights, as RT earlier reported. Meanwhile, dozens of other US cities, towns, villages, and counties have passed measures against the practice, according to Food and Water Watch. In December, New York became the first US state to ban fracking.